When you are in the market to buy a rifle scope then you will find out that there are many options available for you to choose from. This large selection makes it challenging to narrow down to the available choices so you can find the best rifle scope for your needs. As we also all know, every brand claims to be the best and provide the best rifle scopes you could ask for. If you don’t want to waste your money by trying many different rifle scopes until you find one that fits you, then narrowing down your choices by figuring out what is important for you to have and reading up on rifle scope reviews is essential in your buying process. There are many guidelines and tips available that help you when you want to buy a rifle scope that works best for you. 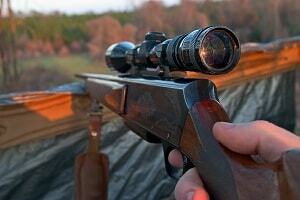 Make yourself aware what kind of hunting style you have and what you need the rifle scope for. If you understand what is important for you then you have a much easier time to prioritize what kind of rifle scope you want or need to buy. It’s not the highest prices rifle scope that will be the best fit for your needs. It’s the rifle scope that matches the most of your personal requirements and wishes that is the best. There are several features that any good rifle scope must provide. The first thing to consider is actually not even part of the scope. It is the gun mount. You will only get the best aim and shot if your scope is securely mounted and cannot move. Otherwise, you are asking for trouble. Make sure that you put your new rifle scope on a solid and perfectly aligned mount. Next you want to consider the image and the quality of the image you get with the rifle scope. You can keep several things in mind when it comes to this. You need to make sure that the optics allow for as much light as possible to your eye. The more light the scope delivers to the eye piece, the sharper the image will be and the better the ultimate shot will come out. As larger lenses, like 50 mm lenses, delivery more light, they have become a lot more popular lately. A larger lens will provide a bigger light gathering capability which will result in a lighter and sharper image. Another consideration is the lens quality. The quality of the lenses and optics has a huge impact on the overall quality of the scope. You can detect the quality of the lenses by whether there is some visible distortion around the edges. On top of that there are usually coatings applied to the lenses that reduce reflection. This avoids glare and allows to gather more light for a brighter and crisper image. You shouldn’t buy a lens that is not multi-coated. Most higher value brands provide only multi-coated lenses. You also want to make sure that the rifle scope you want to buy is watertight. The last thing you would want is a scope that gathers water in it and prevents you from shooting. In addition to that lookout for a scope that is fog proof so you won’t get fog collecting on your lenses while you are out hunting. Additionally, you want to make sure that your aim reference point doesn’t change between shots. You want to check for parallax errors in that case. You want your scope to allow for slight changes in the eye position without changing the aim of the scope. Most quality rile scopes will be parallax error free up to 100 yards. Lastly you want to take the level of magnification into your buying decision. The magnification of the target imagery is important to consider. If your gun is powerful and allows to hunt over large distances then you want to make sure that the magnification of the rifle scope supports these large distances to the target. However, most of the time you probably don’t want any magnification as it will influence your natural capability to deal with distance drops. Keeping all these things in mind in your search for the best rifle scope for your needs will help you save money and missed shots. Check our other resources when you want to buy a rifle scope.